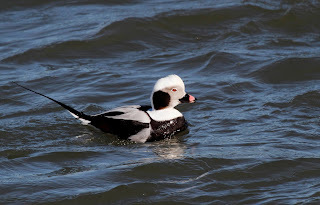 OK, so I had a great time at Barnegat Lighthouse with the Harlequins. 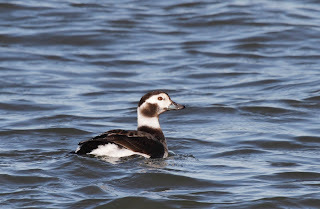 I also got some pretty good photos of Long-tailed Ducks (again). I just can't help myself from taking more photos of these ducks. I finally had good lighting to get a few photos. There were about 40 of them swimming along the inlet and calling to each other too. 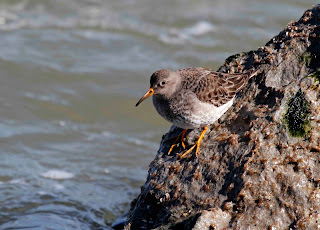 Still on the jetty, I also had close encounters with Ruddy Turnstones and Purple Sandpipers. I think that these photos tell a great story of how these birds make a living. 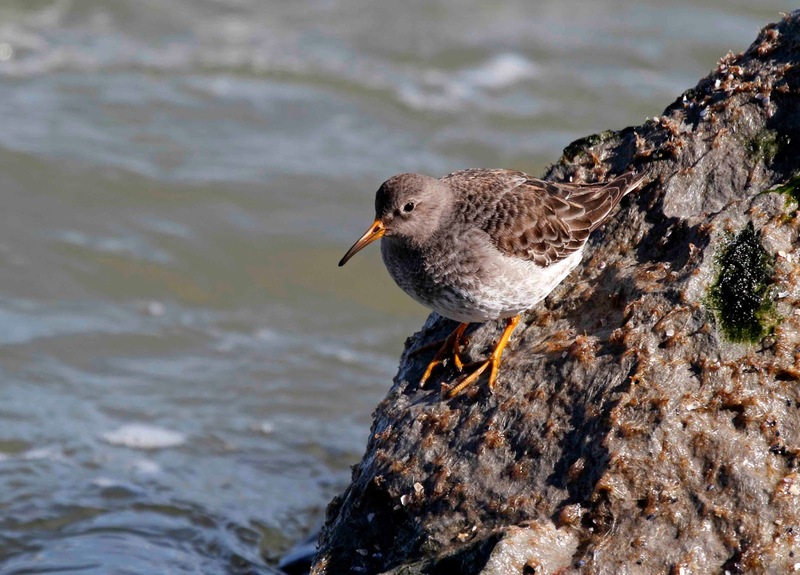 Both species pick food off of the rocks just along the water line and have a sixth sense about when they need to get out of the way of waves. Red-breasted Mergansers also hang out in the inlet and along the jetty. Have you ever had a really bad hair day? Well then, you can relate to the male Red-breasted Merganser. Check out his doo! All of the photos you've seen so far were taken before noon. I thought I hit the mother load and I didn't even have my Diet Coke yet. For those of you who are not familiar with Barnegat Lighthouse, it is located at the northern tip of Long Beach Island. There is only one bridge on to the island located about in the middle. You have to travel miles north through little shore towns including "Surf City", "Harvey Cedars" and "Love Ladies". 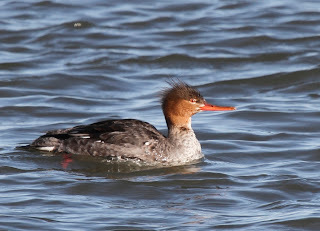 I stopped along a bulkhead on the back bay in Surf City on my way off of the island to see if there were any other ducks. As I got out of the car, a few ducks dove underwater due to the sound of the car door. To my surprise, one of the "ducks" popped up about 20 feet away from me and wasn't a duck at all. It was a Razorbill! Razorbills are birds that spend almost all of their lives in very cold ocean water. 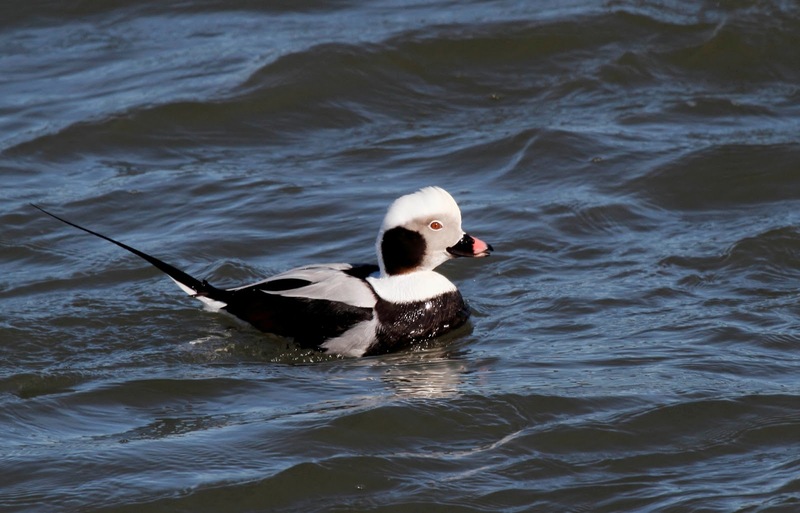 They are part of the alcid family which also includes Puffins. 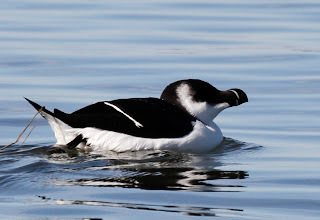 Razorbills have been seen as far south as Sanibel Island Florida this winter. 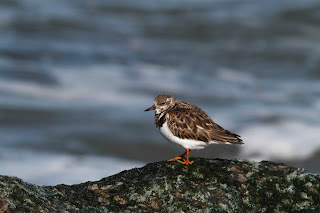 Barbara, Diane and I saw a few flying off of Cape May Point last month but they were really far away. 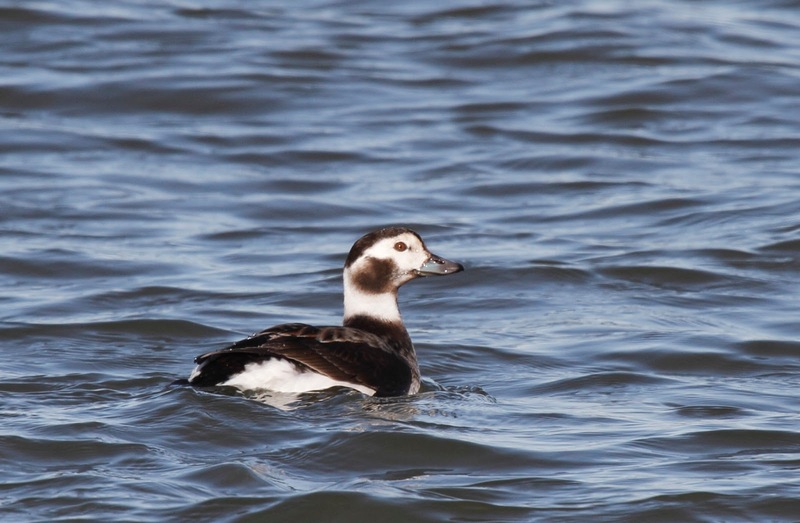 We also saw a few tiny black blobs flying over the water on our pelagic trip last year. Nothing compares to the view that I had from Surf City bulkhead. I was so surprised that the first few photos came out blurry due to my shaking. When I calmed down a bit, I got a few good shots including this one. You can see why they are called Razorbills. 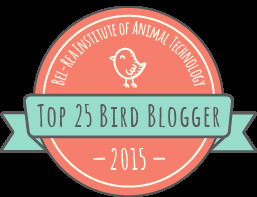 They have a funny shaped bill with a great white stripe through it. This was just a huge bonus to the day. But wait, there's more. The Razorbill was photographed at 12:15. I still had the whole afternoon to explore some more. Part 3 coming soon. Yea, Linda! They just get better and better. Can't wait for part 3. 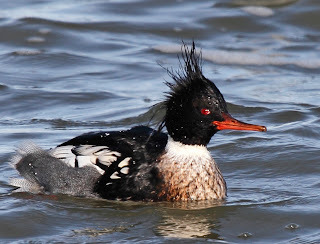 Can I use your photo of a Female Red-breasted Merganser on my blog please? I will of course credit you. Lovely photo!